Who do you think won Tuesday's debate? 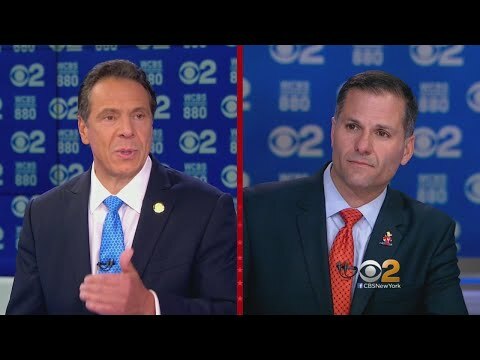 The only one-on-one debate scheduled before the Nov. 6 election got testy as Cuomo and Molinaro attacked each other mid-sentence. Democrat Cuomo, a resident of New Castle, repeatedly tried to link Molinaro to Donald Trump, also a native New Yorker, even though the Dutchess County Executive said he wrote the name of a congressman for President in 2016. "You’ve interrupted me every time I’ve spoken," Molinaro said on WCBS-TV and radio, before adding, "excuse me, sir. You’re acting like a schoolchild." Molinaro questioned Cuomo's ethics, saying he leads the most corrupt state in America. Molinaro referred to the recent convictions of top Cuomo aide and longtime friend Joseph Percoco of South Salem, as well as other officials from his administration. “At which point after eight years in office will you take responsibility?” Molinaro asked. “This isn’t about Joe Percoco, it’s about you and me," Cuomo replied, before conceding that "people in my administration made a mistake." Cuomo also mentioned former Republican Gov. George Pataki of Garrison, who in 1994 upset Cuomo's father, Mario, after three terms as governor. Cuomo called Molinaro “an acolyte of Donald Trump, a mini-me of Donald Trump who is decimating health care in this state." Molinaro spoke against universal health care, saying it would be too costly, prompting Cuomo to say, "He’s with Mr. Trump. There should only be health care for rich people." “Neither was I,” Cuomo said. Molinaro also said he opposes Trump’s plan to roll back rights for those who are transgender. Three minor party candidates -- former Syracuse Mayor Stephanie Miner of the Serve America Movement (SAM), Howie Hawkins of the Green Party and Larry Sharpe of the Libertarian Party -- did not participate in Tuesday's debate, but they have agreed to appear with Molinaro at a Nov. 1 candidates forum. Cuomo has not said if he'd attend the League of Women Voters' forum in Albany. Afterward, Molinaro said the debate miserably failed to address issues unique to upstate New Yorkers: only one question explored the future of the Buffalo Bills. “Upstate has been abandoned by 'Angry Andy' and his New York City backers," Molinaro said.